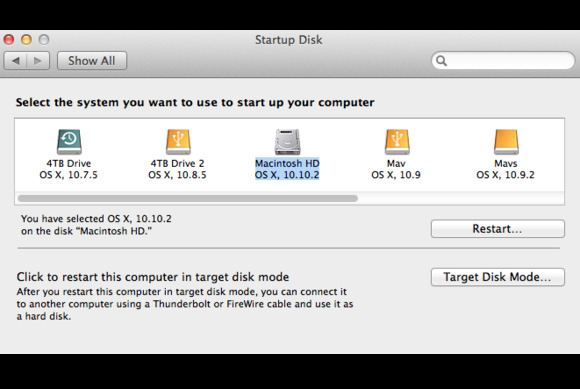 I haven’t fully committed to running OS X Yosemite on my Mac, but I do it often enough that I find myself having to change from my Mavericks startup disk to the Yosemite disk every couple of days. Is there a faster way to do this than through the Startup Disk system preference? The first bit of the script asks for your administrator password so that it can change startup volumes. The restart command is there to ensure that you’re prompted to save any unsaved changes in open applications before the Mac restarts. As seen in AppleScript Editor. You’ll want to create two copies of this—one for the Mavericks volume to boot into Yosemite, and another for the Yosemite volume to boot into Mavericks. Save each one as an application and place them on the appropriate drive. When you’re ready to switch, just double-click the appropriate copy of the app you created. This takes advantage of two AppleScript features introduced with Yosemite—the “with prompt” parameter and the “save state” option. The first allows us to create the prompt that tells you what will happen when the app runs. The second allows you to configure how things are saved when the app restarts or shuts down your Mac. The fancier Yosemite version with prompt.